Analog inspired real-time vocoder for retro and modern sounds. Over the past four decades, vocoders have been used to stunning effect, transforming human voices into various forms of robot speak on hits by Herbie Hancock, Kraftwerk, Daft Punk, Afrika Bambaataa, and countless modern hit-making producers. Developed by Softube, exclusively for UAD hardware and UA Audio Interfaces, the Softube Vocoder plug-in takes its sonic cues from the best analog vocoders of the past, while adding new features to take the iconic effect into the future. In this video, Softube product specialist George Reece shows you how to harness the Softube Vocoder on vocals, drum loops, and more. 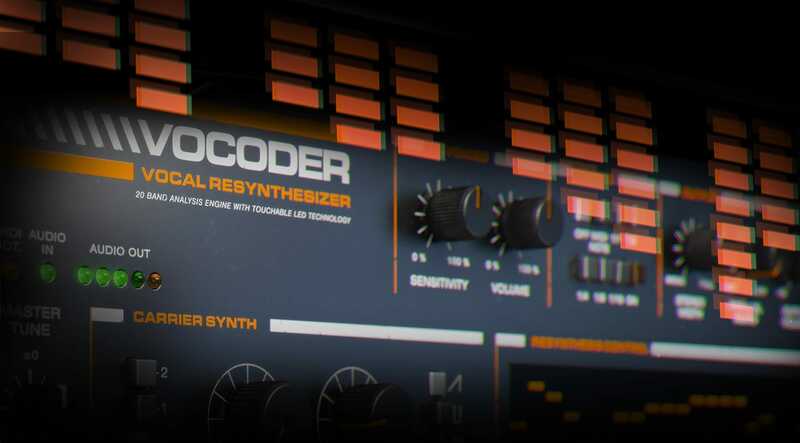 Powered by an onboard, analog-inspired synthesis engine, the Softube Vocoder plug-in bests other emulations of the classic vocoder effect with its warm, gritty, three-dimensional sound. And with a purpose built feature set, including 6-voice polyphony, four waveform types, pitch modulation, pulse-width modulation, and more, you can easily fine tune or totally reshape your sources with a bonafide analog synth. The Softube Vocoder plug-in gives you unprecedented control of the spectral response of your vocoded performance. Each band of the Vocoder analyzer can be independently adjusted, or grab the Spectral Tilt control to rapidly shift from high to low frequencies. The Parallel Blend control mixes the dry/wet signals allowing you to fine tune, or automate, the amount of synthetic texture added to your source. A feature only found on the Softube Vocoder, the Freeze control lets you capture a snippet of a vocal, for example, and create chopped, DAW-synced rhythms within a track. And with real time control via MIDI, Freeze unlocks new creative possibilities for musicians and producers looking to create genre-bending sounds. Inspire your self with this plugin . The Softube Vocoder adding new dimension . I love it. Very good for backing vocals and adding a new dimension. Cool to mess around with, works well when tweaked just right. This is a great Tool for modern Vocals. I use the Softube Vocoder for Rap-Vocals as an effect. It´s also great for Backing Vocals. This is a very simple vocoder with a vibes sound. It's quick and easy to just open up and get something going that will sound good and inspire you. It's probably the most analogue sounding software vocoder I've used. Who needs more eq, reverb, delay, tape? Also, sounds better than the other few software vocoders I've tried and more fun to use, too. This is a very simple vocoder with a vibey sound. It's quick and easy to just open up and get something going that will sound good and inspire you. It's probably the most analogue sounding software vocoder I've used. But the simplicity has the drawbacks of making it a bit limited. It doesn't have any built in effects so you will have to rely on other plugins for that. But most importantly it cannot take in an external carrier signal. So there is no way to use this with for example a bass, guitar or other instrument of choice. That would make it so much more useful, especially for live use. With this in mind I think the price is a bit steep. But what it does it does really well. There's tons of creative fun to be had with this, especially if you pair it with other effects (do try it with the Lex 480L). This is a Vocoder... a Vocoder... a Vocoder!!! Sprachverständlichkeit ist extrem hoch, die klanglichen Möglichkeiten ebenso. Zusammen mit Xils 5000 Vocoder das Beste was es auf dem Markt gibt! Kauft das Ding - es macht Spaß! I am having lots of fun with this plug. The plugin is great. It feels like you are working with hardware instead of software. Very stable. Good sound and many options. Perfect buy. I am a keyboard player and a big fan of vocoders. Make sure you use it as a software instrument plug in and side chain the audio track so you can use a midi controller to play the vocoder. Works great both ways as a plug in and an instrument, very nice and versatile vocoder sounds. The best vocoder around, I've been looking for this for a long time! I compared some vocoders, because I wanted to integrate one of it in my Cubase DAW. After some days of testing the same inputs and similar programs on several vocoder plugins I decided to buy this one. Most vocoder plugins had too much parameters or a very special/unique sound, I searched one for a fast workflow and my experience showed me, that the carrier function of the Softube Vocoder has all I need tu use the resynthesis part with my vocal, speech, drum, motion pad or other modulation inputs. A very fine tool for me to work/play with. This is a fun A*$ plugin! I made some crazy sounds and tracks with it. Don’t sleep on this one ! This thing gave me goosebumps! You can create so many different sounds, really fast. The sound is unmatched, I’ve never heard any software like it !